The first Methodist church at Tattingstone was erected in 1801, for a Wesleyan Society which had been registered in 1797. This is roughly the same date as a Wesleyan Society was formed in neighbouring Brantham, but while the Society there does not appear to have built a proper chapel until as late as the 1960s, the Methodists of Tattingstone seem to have been a more energetic lot. The 1801 chapel was replaced in 1842 by a structure which seated more than 200 people, and Ebenezer Moulton, the Wesleyan minister at the the time of the 1851 census of religious worship, claimed that it was filled every Sunday. His Anglican counterpart in Tattingstone, Charles Boileau Elliot, bemoaned the fact that a third of the population of the parish were dissenters, and barely a hundred people attended service at the parish church. In fact, given that this was a parish of just 426 people, meaning that three-quarters of the parish were going to church on a Sunday, these were both good attendances, and a remarkably high proportion for Suffolk. It was probably this success which justified the building, in 1877, of this grand structure in polychromatic brick out on the road to Bentley. But these were the harvest years for the Methodists, and attendances would go into a steep decline through the 20th Century. The Methodist church at East Bergholt closed in 1982, and this one followed in 1988. It has been subdivided into several private houses. 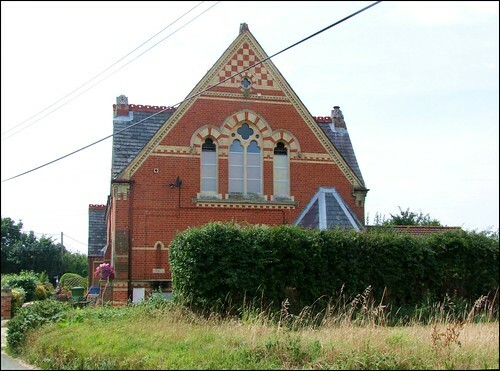 Only the 1961 Methodist chapel at Brantham now survives as a reminder of the popular dissent of this area's agricultural labourers.